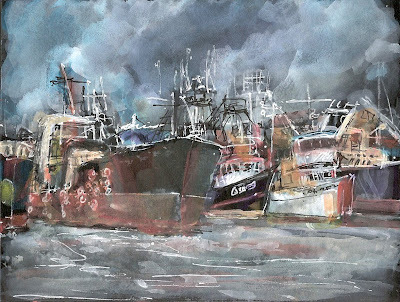 Seattle Plein Air has been going to Fish. Term. every Wednesday for a few weeks now. The weather even let us out today! I think it's due to my friend Leigh's good karma. Most of the morning the sky was a little friendlier than this, but right over these boats it was quite grumpy. What a turbulent feeling. I like it very much! This is really beautiful. I love your paintings over the black background.